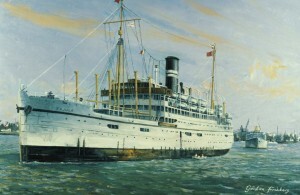 Rajula, a classic ship available as a signed open edition. Rajula at Madras, original sold. By Gordon Frickers, a marine art, 40 x 61 cms (16″ x 24″), Oils, the original painting was a commission. 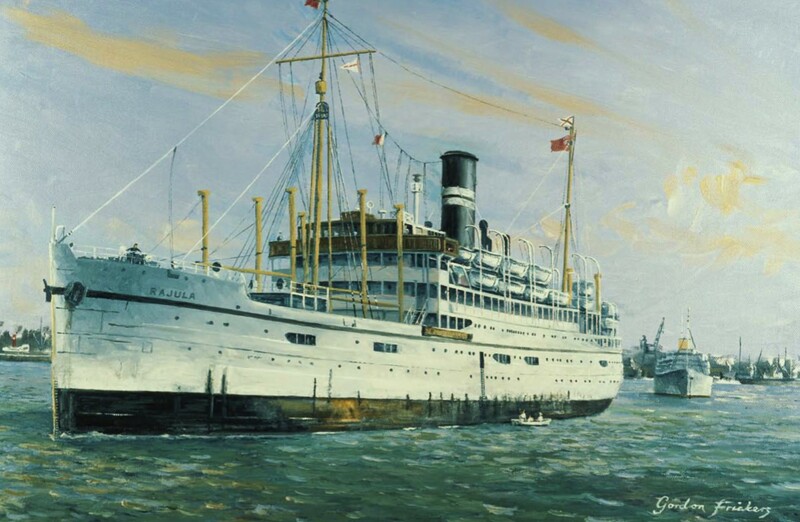 On of The British India Collection, this marine painting of the classic British India Steam Navigation Company ship ‘Rajula‘ was a commission. As Rajula dates back to 1926 careful research was needed. Rajula was one of the best known most loved ships in the British India Steam Navigation Company Ltd fleet. Would you like to purchase or commission a painting of this quality? This beautiful picture is reproduced to have the look and feel of the original painting. “I received the print on Monday. I’m sure it will bring back many happy memories of the time I spent on the Rajula in the late sixties and be a source of enjoyment for years to come. Many thanks for the helpful notes on framing“, best wishes, T. Dexter. “Rajula“: was a classic steam turbine powered ship continues to stir the salt in people’s veins. “Rajula” left such celebrated carriers as the Cunard Atlantic liners Queen’s well astern so far as total compliment of people carried was concerned. British India Steam Navigation Company Ltd was and still is among seafarers affectionately known as B I was at one time the largest merchant ship fleet in the world, a fleet that both officers and crew were proud to serve. Among Indians competition for a place was intense as was their pride in working for BI.